The last time Spring Grove won a YAIAA title before Saturday, Richard Nixon was the U.S.
Before Saturday's game, the last time Spring Grove won a YAIAA boys' basketball championship, Richard Nixon was the U.S. president, the Baltimore Colts were Super Bowl champions, and a 45-year-old Joe Paterno had just finished his fifth season as the head football coach at Penn State. Spring Grove head coach James Brooks was just 1 year old. In the 42 years between the Rockets' 1971 league title and Brooks' hiring in 2013, Spring Grove's boys' program fell a long way. In the two seasons before Brooks took over, the Rockets went a combined 2-41. Three years later, the Rockets are the class of York-Adams basketball once again. 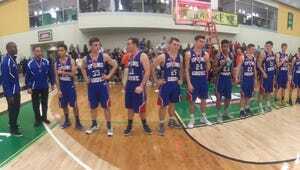 Spring Grove beat Central York, 42-36, on Saturday at York College to claim the league championship. So what's changed for Spring Grove over the past three seasons? The arrival of Eli Brooks has played a huge part in the Rockets' resurgence. Brooks was a freshman during his father's first year as head coach, and Spring Grove's record has steadily improved over the junior's career. The Rockets went 7-15 in 2013-14, 15-10 last season and are now 22-2 heading into the district playoffs. The league's leading scorer, Brooks carried Spring Grove on Saturday, just as he has practically all season. The 6-foot-1 guard finished with 26 points against the Panthers, including 17 in the fourth quarter. But those in the program insist more has gone into the Rockets improvement than just Eli Brooks' growth. Senior Darin Gordon said the the mindset of the entire team changed when James Brooks became the head coach. "The outlook on the whole situation changed," Gordon said. "We addressed that we were in a bad spot, but that we needed to turn things around. Once we got that attitude that we were going to make a difference, that attitude helped us get to where we are now." Despite the program's shortcomings, James Brooks said he was confident the Rockets could turn things around, especially since he coached most of the current players throughout their youth. Still, Brooks admitted, the team is "ahead of schedule of where I thought they would be." Even for most of this season, Brooks said he thought it would be difficult for Spring Grove to win a league title. When the Rockets lost to Central York for the second time on Jan. 15, the coach said the Rockets couldn't throw "magic dust" on themselves and become "elite overnight." They might not have found that magic dust, but on Saturday night they did earn a comeback win against the top-ranked team in District 3 Class AAAA. "I think it was just confidence," James Brooks said. "This was not our best tonight, and we're still beating a legit team and coming back on them. I challenged them to be tough, and they did it." The final chapter of Spring Grove's season has yet to be written, as the Rockets turn their focus to the district playoffs and a possible berth in the state tournament. As for the future, both James Brooks and his players believe Spring Grove will remain an elite team for some time. They lose three starters after this season and Eli Brooks after next year, but the Rockets say they've built a foundation for success. "This (title) didn't come from one year, two years, it came from all the dedication we put in throughout our childhood," Eli Brooks said. "Hopefully other kids are buying in. Just remember to work hard, and good things will happen."